This option is not yet available in ThoughtMesh beta. The Cross-Cultural Partnership brings together people from indigenous and electronic networks in a series of Connected Knowledge conferences to devise cultural norms and legal frameworks for sharing culture--whether Native chants, Java classes, or herbal medicines--in a way that is responsible and sustainable. This resource page for the Connected Knowledge series includes background information its participants, and related readings. You can learn more by clicking links at left or thematic tags above. Web site by Still Water. ThoughtMesh software by Jon Ippolito and Craig Dietrich. The participants in the Connected Knowledge conferences represent some of the brightest minds and hearts in electronic and indigenous networks. Click on names at left or tags above to explore some of their common interests. Alethea is from Iqaluit, Nunavut, where she owns a small production company called Unikkaat Studios. She is also part of another film production company, which she co-owns with three other Inuit women, called Tajarniit productions. Both companies are producing Inuit cultural documentaries and Inuktitut language film productions, focusing primarily on Inuit traditional stories. Alethea graduated from the Illustration program at Sheridan Institute, and is currently in an animation training program with the National Film Board at the Banff Centre. Alethea is also the president of Ikummaksaqtiit (Flamekeepers) Society, a non-profit organization with a mandate to promote and preserve the language and culture of Inuit elders. She is also a on the board of directors for the Ajjiit Nunavut Media Association. In a recently completed new media project, she was part of the core team that developed an online learning resource. The aim of the project, a collaboration between Acadia University and drumsong communications inc, is to teach Inuit and non-Inuit youth alike, about the core principles of Inuit societal values as described in the "Inuit Qaujimajatuqangit" (or Inuit traditional Knowledge) section of the Government of Nunavut's "Pinasuaqtavut" guiding document. The online resource includes an interactive adventure on a ship across a few communities in the arctic, as well three databases - one containing Inuit art prints, the second containing Inuit soapstone sculpture, and a third databse containing clips from interviews with elders on the topic of one of the most prominent Inuit teaching stories, "Kiviuq". Joline Blais is an Assistant Professor of New Media at UMaine and co-founder of Still Water, a research lab devoted to studying and nourishing network culture. She previously directed Digital Media Studies at NY Polytechnic University and introduced media studies in SCPS at NYU. Blais' research and creative work explores sustainable communities and new narrative and poetic forms, and includes the 2006 book At the Edge of Art, which examines ways that digital technologies have reshaped art. She is currently exploring the connections between electronic and indigenous networks in projects such as In the Presence of the Sacred, which links new technologies to indigenous storytelling and ritual; Babel/Babble, poetry generated from infant speech; Return to the Land Bridge, a game that requires indigenous awareness to survive the future; and the Cross-Cultural Partnership, a legal framework for sharing connected knowledge in a way that is responsible and sustainable. Gina Brooks is a member of and councilor for the Maliseet Nation at Saint Mary's in Fredericton, New Brunswick. As an artist, Gina has received grants from the Aboriginal Arts Program of New Brunswick and is at work on a culturally specific craft project entitled Wabanaki Quillwork. 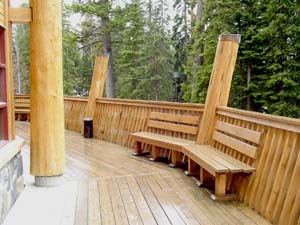 Brian Calliou became the Program Director for The Banff Centre's Aboriginal Leadership and Management in August 2003. He brings a wealth of experience to this role. Aside from being the former Associate Director of the Aboriginal Leadership and Management programs from 2000 to 2002, Brian has served on a number of Boards. For example, he served as the Chair of the Alberta Historical Resources Foundation Board, and presently serves on the Board of the Indigenous Bar Association as Vice-President. Brian was a sole practitioner with Brian Calliou Law Office in Calgary, Alberta and ran a general practice but focussed primarily on corporate law, real estate, personal injury, and Aboriginal law. Brian developed and taught two courses for the School of Native Studies at the University of Alberta - one on Aboriginal Economic Development and the other an Introduction to Aboriginal Legal Issues. He also was a sessional instructor at the University of Calgary teaching the Introduction to Law and Society course in the Faculty of Communication and Culture at the University of Calgary. Brian is a member of the Sucker Creek First Nation in north central Alberta. He holds memberships with the Canadian Bar Association, and the Indigenous Bar Association. Brian holds a Bachelor of Arts in Political Science, a Bachelor of Laws and a Master of Laws from the University of Alberta. He has published works in various academic journals and books such as his "The Culture of Leadership: North American Indigenous Leadership in a Changing Economy" in Indigenous Peoples and the Modern State, and co-authored "Aboriginal Economic Development and the Struggle for Self-Government" in Power and Resistance: Critical Thinking about Canadian Issues. Brian's research interests include Aboriginal leadership, self-government, economic development, Aboriginal and treaty rights, and legal history. Kimberly Christen is an Assistant Professor at Washington State University. Kim's primary research involves examining contemporary indigenous alliances primarily in Australia but with comparative analysis globally. She has worked in Tennant Creek, N.T. Australia over the last decade with Warumungu community members on several collaborative projects including: a community history book, DVD, website and most recently a community digital archive. Kim is currently involved in research exploring the overlap of indigenous cultural heritage work, intellectual property rights and the use of digital technologies in and by indigenous communities to virtually repatriate cultural property. Her publications and more information about her projects can be found at her blog, Long Road at www.kimberlychristen.com. Tom Crane Bear is an Elder, Teacher and Spiritual Leader, heralding from the Siksika Nation. He is a Pipeholder and remains steadily involved in the traditional Blackfoot Societies. The Indigenous Peoples of the World in New Zealand have bestowed upon Tom, the title of Honorable Elder. At 53 years of age, Elder Tom returned to school and graduated Grade 11. Through Elder Tom's extensive life experience, he has become an accomplished teacher and life-leader in diverse areas spanning cross-cultural boundaries. Tom received Nechi Institute training, then taught Wellness at Oklahoma State University in Continuing Education and Health. He has travelled extensively through the United States and Canada teaching these concepts and programs. Elder Tom continued his education by taking Life Skills Coaching Training in Edmonton and again increased his contributions to his community by teaching the same program in Calgary. Elder Tom has worked for Corrections Canada as Spiritual Advisor at Alberta prisons and has worked for Native Counselling Services by directly applying his experience and education for the benefit of indigenous youth. From 1990-1995, he worked as the Police Commissioner for Siksika Police Services and currently is Elder Advisor for the Siksika Land Claims, Siksika Justice and Aboriginal Justice Learning Networks in Ottawa. Since the 1990's, Tom has continued his work as Elder and Spiritual Advisor for most of The Banff Centre's Aboriginal Leadership and Management Programs, bringing his wisdom, experience and insight to our many participants. Mark Daggett is an artist, designer, and technologist who works mainly in the field of social software and networked knowledge. Presently Daggett is a Ph.D. student in the Media Arts and Technology department at the University of California at Santa Barbara. Daggett is also a User Experience Architect at Locus Focus, a privately held development consultancy in Kansas City. Previously Daggett has been a social software researcher for the video syndicate Revver.com, and Director of Information Architecture for Skechers USA. Artistically, Daggett's work has been shown in museums, festivals and exhibitions around the world. His work has shown in the Whitney Museum, the Princeton Museum, P.S. 1, and the Transmediale festival in Berlin, to name a few. Daggett has been nominated for several prestigious awards, including a 2006 Rockefeller New Media Grant, and a Webby Award, (which is sometimes called the Oscars of the Internet). Major media sources have covered Daggett's work, including the New York Times, Le Monde, WIRED Magazine and Surface Magazine. Craig Dietrich is a new media artist and researcher currently on the editorial staff of USC's "Vectors Journal of Culture and Technology in a Dynamic Vernacular" and a MFA candidate in Intermedia at The University of Iowa. His personal and collaborative work centers on public engagement, interface, and trans-nationalism manifesting in traditional and new media forms. Craig is presently in production of "USA Today," a media project investigating trans-nationalism's consequences on American activity. His recent collaborations include Margaret Crane|Jon Winet's "2004-America & The Globe," "Impossible Geographies" at the SOTO Gallery (named Best of 2005, Boston Globe) and Fabrica Gallery in Brighton, "Z1SMS", a mobile device research project at the ZeroOne Festival in San Jose, and the international World Cup exhibition, "Goal 2006!" Wendat (Huron) from Wendake near Quebec city (Quebec), Guy Sioui Durand is a sociologist (Ph.D.), art critic, and independant curator (www.siouidurand.org). He often participates in art events in Canada and in other countries. In 2003, Sioui Durand was part of Making a Noise: Aboriginal Perspectives on art, art history, critical writing and community, organised by The Banff International Curatorial Institute. In 2004, he wrote for HorizonZéro, no. 17, Raconter: narrations autochtones et médias numériques, The Banff New media Institute (www.horizonzero.ca). In 2005, he was invited to Refresh: The First International Conference on the Histories of Media Art, Science and Technology also at Banff. The same year he was part of The Hemispheric Institute's 5th Encuentro Performing Heritage: Contemporary Indigenous and Community-Based Practices at Belo Horizonte, Brazil. In 2006 he participated in Curatorial practice and beyond: an ethic parti-pris au colloque; "The Way Ahead: Surveying the Curatorial landscape," Aboriginal Curatorial Collective/Collectif des Conservateurs Autochtones (ACC/CCA), Urban Shaman, Winnipeg; and in this spring 2007, he presents allocution to Corralling aboriginal art: Aboriginal curatorial practices in The Prairies and beyond at ACC\CCA, Saskatoon. Charlene Francis is an artist and elder in the Penobscot Nation. Her art has been exhibited nationally and internationally and spans a range of traditional and nontraditional handmade media, including quillwork, jewelry, and sculpture. Charlene is a leader in coordinating tribal ceremonies for her community and participated in the 2006 international "Connected Knowledge" conference at Lucerne-in-Maine. Charlene is also the Vice-President of the Native American Church of the Wabanaki, an organization new to the Maine area. She has also been involved in teaching culture and environmental and survival skills to inner-city students from grades 7-12. This was her proudest accomplishment. This highly successful program was developed in order to reduce alcohol and drug abuse among our youth and to reduce the dropout rate in middle and high school. The youth were to become the first Native American 4-H Challenge group in the state of Michigan. Curriculum was developed from existing curriculum to reflect our culture, spirituality, and beliefs. Charlene is of the fisher clan and carries the name "wahbahzhiishii" or marten. She was fortunate to be able to live with and learn from the Anishnabe in Michigan and Wisconsin. These are the teachings she shares with others. Vera Francis is a Passamaquoddy and an educator, activist, grandmother, and proponent for environmental justice and community advocacy. Her past work has focused on indigenous education and applications of popular theater. Vera currently is based in Fredericton, New Brunswick, where she is the Policy & Implementation Officer for the Atlantic region of the National Centre for First Nations Governance (http://www.fngovernance.org/), an organization devoted to supporting First Nations as they seek to implement their inherent rights of self-government. Alexander R. Galloway is an author and programmer. He is a founding member of the software collective RSG and creator of the data surveillance engine Carnivore. The New York Times recently described his work as "conceptually sharp, visually compelling and completely attuned to the political moment." Galloway is the author of Protocol: How Control Exists After Decentralization (MIT, 2004), Gaming: Essays on Algorithmic Culture (Minnesota, 2006), and a new book coauthored with Eugene Thacker called The Exploit: A Theory of Networks (forthcoming). He teaches at New York University. i come to this forum with less experience in art and art background, however more in 'creative' ways to bridge the socio-political polarization of the Indigenous Nations of Turtle Island and the newcomer nation-states of North America. It is a remarkable process still unfolding, but with some encouraging signs. My professional background is in human and community development and my interests include Law, History, and Spirituality. i am Wampanoag from the Federation of the Pokaunauket and practice the Ceremonial Life of my People; i am Otter and Turtle Clan; married with three Children; Education and Cultural Specialist and co-founder of the Anikwom Wholelife Center in Maine whose work and proximity correlates to the Wabanaki Confederacy Territories; i am currently adjunct faculty and Still Water Research Fellow for the University of Maine at Orono. Diane Gray is the personal learning advisory/sales associate for Aboriginal Leadership and Management Development. Prior to this role, she was program coordinator and desktop publisher for this area. Diane is member of the Turtle Clan, a Haudenosaunee / Mississauga-Anishinaabe (Mohawk / Ojibwa), and a member of Alderville First Nation that is located along Rice Lake in southeastern Ontario. She was raised in Toronto then moved in the 90s, with her three children, to a farm in Peterborough, Ontario, where she continued to operate a successful landscape design business. An accomplished martial arts student, Diane obtained her black belt in taekwondo and represented Team Ontario at the 1995/97 North American Indigenous Games. Over the years, she has shared her self defence awareness knowledge and held community workshops for Aboriginal women programs. In 2000, Diane sold her business and became a full-time student at Trent University. While at Trent, she was a volunteer for the Annual Elders Gathering and vice-president of the Trent University Native Association. She worked in the Native Studies PhD program and was a Native Studies departmental assistant. In 2003, Diane received a diploma in Native Management and Economic Development, and in 2006 earned a BA Honours in Native Studies. Diane plans to continue her education in the area of Aboriginal Cultural Resource and Management. María Victoria Guglietti studied Journalism at the Universidad del Salvador, in Buenos Aires, Argentina, from where she got an honors degree in 2000. In 2002, she moved to Canada where she did her MA in Communication Studies at the University of Calgary. She successfully defended her thesis on the relationship between new media art and the negotiation of cultural differences (Stranger's Images: Net Art and Another Representation) in June 2004. In September 2004 she was admitted as a full time student at the PhD program in Cultural Mediations offered by the Institute of Comparative Studies in Literature, Art and Culture, Carleton University. During her studies Maria Victoria has specialized in postcolonial and transnational theory, theory of community, community media practices and online communities. For her dissertation, Maria Victoria studies emerging negotiations of community among Aboriginal new media artists. Jon Ippolito invents ways to build and sustain networks, a fact that often makes him unpopular with media monopolists, bureaucrats, and other apologists for hierarchic culture. Ippolito works with the Variable Media Network to devise new preservation paradigms to rescue digital culture from obsolescence, with the Open Art Network to promote open architectures for media art, and with the Interarchive working group to find net-native ways to connect online scholarship. He's exhibited collaborative artworks at the Walker Art Gallery, ZKM, and Harvard; curated shows for the Guggenheim on virtual reality and Nam June Paik; and written for the Washington Post, Artforum, and Leonardo. Ippolito's collaborative architectures such as The Pool and ThoughtMesh have nabbed Wired headlines, while his book At the Edge of Art, co-authored with Joline Blais, offers an expansive definition for art of the 21st century. Randy Kemp (Choctaw-Euchee Creek) has a BFA in painting from Arizona State University and an Associate of Arts from Bacone Junior College in Muskogee, Oklahoma, where he studied under prominent American Indian artists W. Richard West, Sr., Solomon McCombs, and Ruthe Blalock Jones. He is nearing 20 years of service with Arizona State as a senior environmental graphic designer. He is also a member of the grass-roots community arts group Xicanindio Artes, the performance troupe Los Humanos, and a the Native American National Arts Consortium. Randy is a founding member of the Mayo Clinic Hospital "Sonata del Sol" music program, where he has provided flute music for palliative care patients and visiting families. As a member of Actors' Workout Inc., he has created a one-man show based on Chief Joseph's "I will fight no more, forever" speech. As adjunct instructor with Scottsdale Community College, he has traveled to aboriginal Australian and Maori communities as part of an indigenous cultural arts exchange program. He has been commissioned by community groups to create public murals and sculptures and has recorded musical works blending flute improvisation and computer tone generation. He collaborates with Christopher Martinez on the Radio Healer performance project. Susan Kennard is director & executive producer of The Banff New Media Institute (BNMI) where from 1998 to 2005 she acted as executive producer. Prior to this, Susan worked in television as an associate producer for the "International Hour," "CBC Newsworld," and "Dateline NBC." Her radio career roles were writer/broadcaster for CBC Radio and station manager for CKIZ radio. Susan has extensive experience in policy development, training, and advocacy for the not-for-profit community radio sector across Canada; she is the co-founder of radio90.fm, a hybrid net/fm pirate radio station. In June 2005, Susan concluded a master's degree in communication for development from the University of Malmo, Sweden, on the relationship between contemporary art practice, social change and civil society in post-war Sarajevo. Presently, Susan is a member of the Culture.ca Editorial Advisory Committee and is the jury chair for the Interactive category of the Banff World Television Festival Awards. James Leach is Research Fellow in Anthropology, King's College, Cambridge, and Affiliated Lecturer in the Dept. of Social Anthropology at the University of Cambridge. In September 2006 he will take up a Senior Lectureship at The University of Aberdeen, although remain in Cambridge for the academic year 2006-7. James was trained as a social anthropologist in Manchester (B.Soc.Sci 1992, PhD 1997) and has undertaken long-term field research on the Rai Coast in Papua New Guinea (1994-5, 1999, 2000-2001, 2004). He has published on kinship, creativity, place/landscape and art. James's subsequent work has focused on ownership, including ownership of Intellectual and Cultural Property in Papua New Guinea, and on knowledge production more widely. He is currently engaged in comparative research on creativity and ownership in interdisciplinary collaborations in the UK (artists' placements in research and industrial contexts), directing research on gender relations in the production of Open Source Software (for the European Commission), and on artist's relation to laws of privacy and defamation. A new initiative is currently being planned for research on institutions, 'audit' and how 'value' might be measured in Papua New Guinea. James was awarded the Royal Anthropological Institute J.B. Donne Prize in the Anthropology of Art for 1999, and The Philip Leverhulme Prize in 2004. Louise is from the Nacho Nyak Dun First Nation in northeastern Yukon. She has come from a long line of storytellers and is now the keeper of many of these stories of the ancient and not so distant past. For 15 years she worked with her people all over the Yukon to ensure that the oral histories and stories of the First Nations people were recorded and transcribed for posterity. Cofounder of the Yukon International Storytelling festival Yukon and the Society of Yukon Artists of Native Ancestry, Louise has attempted to esure the voice of her people is heard and will be protected for the future generations. This voice and information is a gift that her people must share for the betterment of the world. She presently works at the Canada Council for the Arts in Ottawa, where she has migrated to with her husband and her grandson to serve the needs of many Aboriginal artists of Canada and abroad. In 2006 she wrote a piece for the New Media Arts program at Banff and has also participated as a guest artist, storyteller for the dance, choreographer and film script writing workshops. Angela Libby is the administrative assistant for the Banff New Media Institute, supporting all areas of programming. She has worked for 7 years in the not-for-profit sector as an educator and also as a community/educational events planner. In 2001 Angela traveled to New Zealand to work for the Canterbury Museum, and then returned to Canada where she accepted a position with City of Ottawa Museums. She later moved on to the Glenbow Museum in Calgary where she worked with the School Programming department to plan and present educational programs for school children of all ages. In 2003 Angela moved to Japan where she spent 3 years as a high school English teacher and peer advisor for other ESL educators. With a post-secondary education in Folklore and History, as well as Museum Studies, Angela has a keen interest in the preservation and dissemination of Canadian culture. The natural beauty and creative energy of The Banff Centre provides a warm and positive environment, and Angela looks forward to an interesting and educational tenure here at BNMI. Christopher (Cristobal) Martinez is a digital Media music composer, and Media Arts and Sciences PhD candidate at the Arts Media and Engineering program, at Arizona State University. Cristóbal Martínez, born in Santa Fe, New Mexico, was raised in the Española Valley community of Alcalde. He is a composer who focuses upon developing music arrangements that consider digital media. Cristóbal resides in Arizona and produces work while under the spell of his Northern New Mexican heritage, Latin American literature and the influence of his childhood fascination with science fiction. Cristobal is interested in the interactive moment between a human and technology. He desires to engage and study the meaning, as well as the cultural and environmental affects of this mergence. His interests stem from the condition he realizes as a digital media music composer. "When I work to express music with digital technology, I find myself echoing a kind of comic book character; this character achieves musical symbiosis between the human body and machine to interface the human mind and digital realm as one. This is how I create music, as a trans-human." I am a member of the Mi'kmaq (Micmac) Nation, founder of the Elders and Youth Council, and cofounder of the Wabanaki Nations Cultural Resource Center, the Miingignoti-Keteaoag, the Esgenoôpetitj Mi'kmaqesk women's council, and Anikwom WholeLife Center. 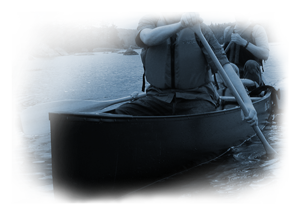 Apart from my activities as a Still Water Research Fellow at the University of Maine, I am also affiliated with the Wabanaki Confederacy, New Brunswick Native Womenâ€™s Council, Elders and Youth Council (Burnt Church New Brunswick), Esgenoopetitj Mi'kmaqesk (Burnt Church New Brunswick), Wabanaki Language Immersion Program (St. Thomas University), Aboriginal Rights Coalition Atlantic (centered in New Brunswick, Canada), and Tatamagouche Center (Nova Scotia). My life-work is dedicated to supporting empowerment for women, youth, families and communities and preserving and teaching Wabanaki culture and spirituality. By also volunteering and serving Clanmothers/Elders throughout Wabanaki and Turtle Island, I advocate the culture and values of physical, emotional, and spiritual wellness. Both my husband and I are very committed to good relations in our family life and lives of others by role-modeling respectfulness within ourselves and for everyone. Participating in the rich experience of our Peopleâ€™s traditional knowledge and practices is the fundamental piece in our work for community wellness. Our communities are faced with overwhelming social problems. Substance addictions, lack of education, poverty, premature motherhood, family violence--these facts paint a disturbing and distorted image of our People. Yet it is not our culture that has created this frightening reality--it is the absence of our cultural teachings and traditions that hurt us. The assimilation process, as experienced by our People and many other Native Peoples, has wreaked havoc. We have come to believe that help must come from within. Neeru Paharia is currently a doctoral student at the Harvard Business School and most recently was Executive Director, CFO, and COO of Creative Commons, where she worked from the organization's inception. Neeru completed her undergraduate work at the University of California at Davis and received a Master of Science in Public Policy and Management with a concentration in Information Systems from Carnegie Mellon University, where she was a Public Policy and International Affairs Fellow. Neeru spent a year in the Coro Fellowship Program, a leadership program in public affairs, and has worked for McKinsey and Company, as an Associate Consultant. Neeru is a filmmaker, illustrator, and blues guitar player. She has shown her work in various film festivals and publications. Emily Paige is the BNMI coordinator, working with public programs and strategic research for BNMI. Her previous work experience includes a variety of administrative and programming roles at the Canadian Museum Association, the Canadian Clay and Glass Gallery, and the University of Waterloo Gallery. Emily's career stems from studies in English Literature and Fine Art History at St. Jerome's University/University of Waterloo. She studied French language and Fine Art at the UniversitÃ© Lyon II, France and continued to develop her painting skills at the Ottawa School of Art. Her mother's obsession with Coronation Street was the reason behind a move to London and Manchester, England, where she spent a year selling Chanel handbags and, later, pulling prints. With origins in a small town in the Ottawa Valley, Emily has found that the Banff life suits her well and is constantly reminding herself of how lucky she is to have moved here for a job. A practicing artist, Emily works with text, recycled masterpieces, offensive colour combinations and acrylic paint. Darren J. Ranco has a joint appointment in Native American Studies and Environmental Studies at Dartmouth College. A citizen/member of the Penobscot Indian Nation, he graduated from Dartmouth in 1993 with a BA in Anthropology and Classical Studies. In 1998, he received a Masters of Studies in Environmental Law from Vermont Law School and completed his Ph.D. in Social Anthropology from Harvard University in 2000. From 2000-2003, he was an assistant professor of Native American Studies in the Department of Ethnic Studies at the University of California, Berkeley. The title of his dissertation was, "Environmental Risk and Politics in Eastern Maine: The Penobscot Indians and the United States Environmental Protection Agency," and it focused on Penobscot critiques of EPA risk methodologies, which impose dominant cultural behaviors on cultural minorities. In general, his research focuses on the ways in which indigenous communities in the United States resist environmental destruction by using local knowledge to protect cultural resources, and how state knowledge systems, rooted in colonial contexts, continue to expose indigenous peoples to an inordinate amount of environmental risk. He is in the process of completing his book manuscript, entitled, "Tribe at Risk: Environmental Diplomacy on the Penobscot River," and has written about a number of subjects, including environmental risks to American Indians, environmental justice, the continued presence of Northeastern Indians, research ethics in indigenous anthropology, and the problems of representation of Indians in anthropology. He teaches courses on Tribal Governments, Indians and Environmental Issues, Power and Representation in Native American Studies, and Environmental Justice. Wendy Seltzer is a Visiting Fellow with the Oxford Internet Institute, teaching a joint course with the Said Business School, Media Strategies for a Networked World, and researching threats to online free expression. As a Fellow with Harvard's Berkman Center for Internet & Society, Wendy founded and leads the Chilling Effects Clearinghouse, helping Internet users to understand their rights in response to cease-and-desist threats. She has taught Internet Law, Copyright, and Information Privacy at Brooklyn Law School. Previously, she was a staff attorney with the Electronic Frontier Foundation, specializing in intellectual property and First Amendment issues, and a litigator with Kramer Levin Naftalis & Frankel. In the fall, she will be teaching at Northeastern University School of Law. Wendy speaks frequently on copyright, trademark, open source, and the public interest online. She has an A.B. from Harvard College and J.D. from Harvard Law School, and occasionally takes a break from legal code to program (Perl and MythTV). Kim Sheppard graduated from the Nova Scotia College of Art and Design in 2006 with a BFA in interdisciplinary studies. Originally from Halifax, Nova Scotia, Kim is excited to be living in Banff. She works mainly in new media, and is particularly interested in vlogs, blogs and youtube. Her work has been shown throughout Canada and online. In 2006 she completed The Confession Machine, an interactive web confessional, as part of the Centre For Art Tapes New Media Scholarship Program. Jennifer is a new media producer, writer and PhD candidate at the Ontario Institute for Studies in Education at the University of Toronto, where she is exploring the convergence between education, Indigenous knowledge and new media technologies. Since starting her company Invert Media in 2001, Jennifer has specialized in the creation of Aboriginal content. From concept creation to development and production, Invert Media has provided writing and production services for a variety of projects in both the media industry and First Nations communities. Most recently, Invert Media in collaboration with the National Indigenous Literacy Association successfully launched FourDirectionsTeachings.com, an interactive website showcasing Indigenous knowledge through the diverse teachings of five First Nations from across Canada. Thrilled by the response to the site, Invert Media is happy to announce its new partnership with the First Nations Technical Institute, who are actively pursuing the expansion of FourDirectionsTeachings.com to include First Nations from northern and western Canada. In February 2007, Invert Media attended a Product Consolidation Residency at the Banff New Media Institute to develop their latest project, Breach of Contract, a working title, for a serious game that explores treaties affecting First Nations peoples in Canada and the USA. The readings at left provide background on selected cultural, technical, and legal aspects of the Cross-Cultural Partnership. "The Politics of Search: Archival Accountability in Aboriginal Australia", conference paper delivered at MIT5: Media in Transition 5 Conference, "Technological Translations and Digital Dilemmas Panel," April 28, 2007. "Indigenous Domain: Pilgrims, Permaculture and Perl," Intelligent Agent 6, no. 2 (Summer 2006). "Toward a Native Anthropology: Hermeneutics, Hunting Stories, and Theorizing from Within." Wicazo Sa Review, Fall 2006, pp. 61-78. This report blames the Canadian government and former Ontario premier Mike Harris for the death of Native protester Dudley George in an skirmish over land claims in Ontario's Ipperwash Provincial Park in 1995. A CBC news article on the report contains a timeline and other links related to the troubled history of First Nation land claims in Canada. Above (left to right): Wendy Seltzer, Miigam'agan, gkisedtanamoogk, Jon Ippolito, Charlene D. Francis, Joline Blais, Neeru Paharia, and James Leach. 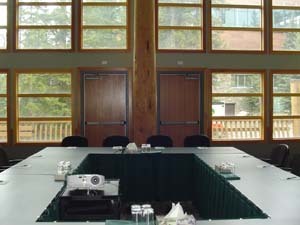 The first meeting of the Cross-Cultural Partnership working group took place from November 16-19, 2006 at the Lucerne Inn in Dedham, Maine. The conference assembled representatives of five nations for an intense period of ceremony, presentation, and discussion. Joline Blais, Still Water, University of Maine. Jon Ippolito, Still Water, University of Maine. James Leach, Social Anthropology, University of Aberdeen/Kings College Cambridge; Rai Coast, Papua New Guinea. Neeru Paharia, Doctoral Candidate, Harvard Economics Department, former director of Creative Commons. Wendy Seltzer, Brooklyn Law School and Berkman Center, former counsel at Electronic Frontier Foundation. 1-2pm: Beyond the Commons: Shared needs of indigenous and electronic networks. Lucerne Inn, Pine Porch (lunch provided). Discussants: Joline Blais and Jon Ippolito. 2:30-4pm: When information doesn't want to be free: The Native perspective 1. 11am-12:30pm When information doesn't want to be free: The Native perspective 2. Discussants: Miigam'agan, gkisedtananmoogk, and others (to be confirmed). 1-4pm: When information doesn't want to be free: The electronic perspective. Hart residence (Joline and Jon's house). 11am-12:30pm Acawiki: A new paradigm for academic networks. 1-3pm: A tribal license: terms, collaborators, and promotion. Discussants: Wendy Seltzer, Joline Blais, and Jon Ippolito. Afternoon and evening: a chance to explore the neighborhood. Lucerne Inn, restaurant (brunch provided). Afternoon and evening: a chance to do more exploring or continue private conversations. The second Connected Knowledge conference took place at the Banff New Media Institute from 27-29 July 2007, and brought representatives of over a dozen nations together to explore and invent innovative models for sharing knowledge and creativity. 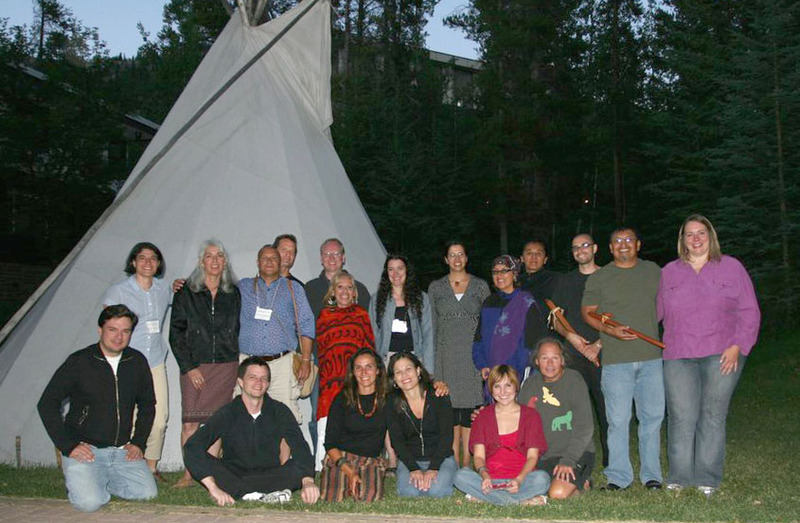 Conference participants consist of two sets: The original contributors to the November 2006 conference in Lucerne, Maine, which included representatives of five indigenous and developed nations; and a dozen or so newcomers selected to expand the ethnicity, geography, and thematic scope of the discussion. The organizers' goal is by the end of the conference to swap the roles of presenters and audience. All meals are buffet style and served in the Banff New Media Institute dining room. Participants who arrive early gather to meet and greet each other. Facilitators: Susan Kennard and Emily Paige, Banff New Media Institute. An opening ceremony acquaints all participants with each other and acknowledges the Native ground on which the conference takes place. Facilitator: Elder Tom Crane Bear, Siksika Nation. All participants introduce themselves by describing their interests that intersect with the conference themes. Facilitators: Joline Blais, gkisedtanamoogk, and Jon Ippolito of Still Water; Susan Kennard of Banff. Facilitators: Joline Blais, gkisedtanamoogk, and Jon Ippolito of Still Water. Facilitators: Joline Blais of Still Water and Susan Kennard and Emily Paige of Banff. The new participants discuss or present their projects related to the conference theme. These can be developed or confirmed during the teleconferences in the weeks leading up to the conference. The original contributors facilitate informal, concurrent, small-group meetings among the newcomers to develop existing or new ideas based on the concepts and tools introduced in earlier sessions. A continuation of Breakout 1. An optional continuation of Breakouts 2 & 3. Newcomers from breakout sessions share the ideas they developed, and all participants discuss their viability and how to take them to the next step. Facilitators: Joline Blais, gkisedtanamoogk, and Jon Ippolito of Still Water, and Susan Kennard and Emily Paige of Banff. A closing ceremony expresses gratitude to all the communities and individuals that made the conference possible and expresses positive intentions toward future efforts. Facilitators: Elder Tom Crane Bear (tbc) and gkisedtanamoogk. The participants to the Connected Knowledge conference at Banff come from very different places, geographically and culturally. The first and foremost goal of our conversation is to foster trust among the contributors. We hope that the mere fact of seeing a stranger's face or hearing their voice before the conference will make them just a bit less of a stranger when we meet in person. Coordinaters of the second Connected Knowledge conference from Maine and Banff meet to compare virtual notes. This conversation looks at new techniques for educating young and old about Native traditions and wisdom, from building social networks to designing electronic games. Tag: education. This conversation considers new legal paradigms to encourage responsible sharing and discourage commercial exploitation of local knowledge. Tag: law. This conversation explores databases, physical collections, and other paradigms for archiving and preserving culture that respect and embody the social mores of the group whose heritage they represent. Tag: archive. This conversation explores the power of electronic networks, their resemblence to indigenous social structures, and ways to make both sustainable in the 21st century. Tags: networks. This conversation looks at the governance exercised by Native peoples and at the forms of personal and communal sovereignty that may be required to tackle problems that national and provincial governments seem unable or unwilling to solve. Tag: governance. Connected knowledge is a theme of related conferences organized or attended by members of the Cross-Cultural Partnership working group. Find out more via the links at left. Craig Dietrich talks at LongGreenHouse about the Mukurtu Archive he helped to design with Kim Christen for the Warumungu people of Australia and the balance it strikes between providing access while preserving cultural norms of privacy and sacred knowledge. The demo of this innovative software serves as a point of departure for a conversation about the connections between indigenous and electronic networks, as well as the role of local determination in an age of global politics. Other participants include elders from the Penobscot, Mi'kmaq, and Wampanoag communities and New Media faculty and students. The Connected Knowledge conference series is organized by the Cross-Cultural Partnership. Click here to return to the home page for this consortium.